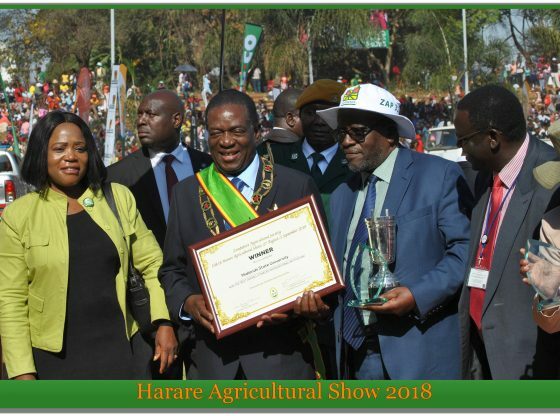 Friday the 31st of August was a momentous day for Midlands State University as the ‘University of First Choice’ lived up to its name at the 108th edition of the Harare Agricultural Show, receiving distinction for the Best Overall Stand by an Education Institution. With tertiary institutions from across the country and from within the region among them universities, polytechnics and colleges exhibiting, winning the much-coveted award for the first time, was no mean feat for the University. 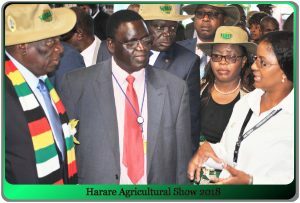 The Harare Agricultural Show, which is the country’s premier agricultural and business showcase attracting both local and international exhibitors is one of the biggest marketing platforms on Midland State University’s exhibitions calendar. Hence to win and receive recognition at the highest level, is ample testimony of how Midlands State University continues to evolve into a dynamic, leading and well respected, stakeholder-driven brand in the provision of quality higher education. Running under the theme ‘Field to Industry: Produce, Connect, Develop’ the show attracted many visitors from all walks of life. The Midlands State University stand received its fair share of visitors with distinguished visitors to the stand including His Excellency, the President of the Republic of Zimbabwe, Cde Emmerson Dambudzo Mnangagwa and Vice President, Kembo Campbell Mohadi. While Midlands State University officials who toured the stand included the Pro Vice-Chancellor Business Development and Administration, Professor Kadmiel H. Wekwete and the Acting Dean of Natural Resources Management and Agriculture, Mr Tendai Madanzi. The winning team that represented the University at the Harare Agricultural show from the 27th of September to the 1st of September comprised representatives from the faculties of Arts, Medicine, Mining and Mineral Processing Engineering, Natural Resources Management and Agriculture, Science and Technology and Social Sciences as well as those from the Alumni Office, Graduate School of Business Leadership, Incubation Hub and Information and Public Relations Office. This latest achievement by Midlands State University comes barely two weeks after the University also won the Best Exhibitor award in the universities’ category at the 2018 edition of the Midlands Agricultural Show. On behalf of the entire University community, we say Congratulations! Makorokoto! Amhlope!